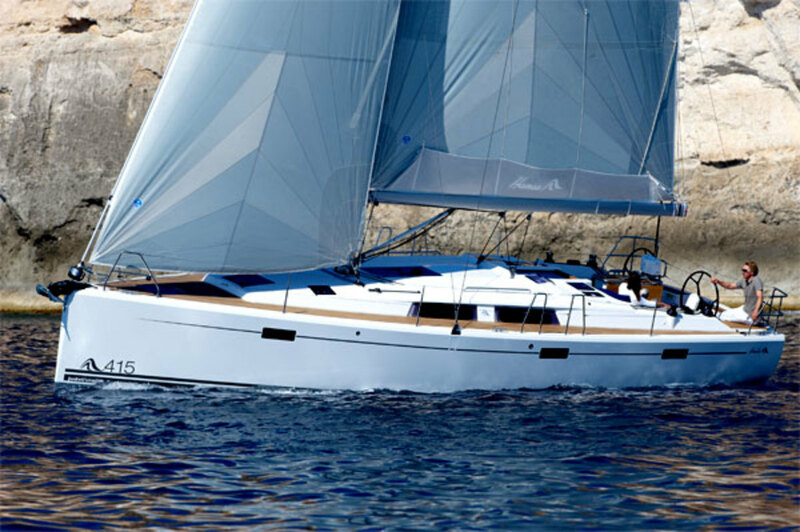 The Hanse 415’s hull is built of solid fiberglass below the waterline, cored with end-grain balsa above the waterline and reinforced with a solid fiberglass grid. The outer skin is isophthalic gelcoat, and both vinylester resin (to deter blistering) and polyester resin are used in the laminate. The deck is also balsa-cored with a vinylester outer layer. Bulkheads are laminated to the hull to increase stiffness. A 6ft 11in T-shaped cast iron fin and bulb come standard, but a shallower 5ft 8in L-keel with a cast iron fin and lead bulb is also available. 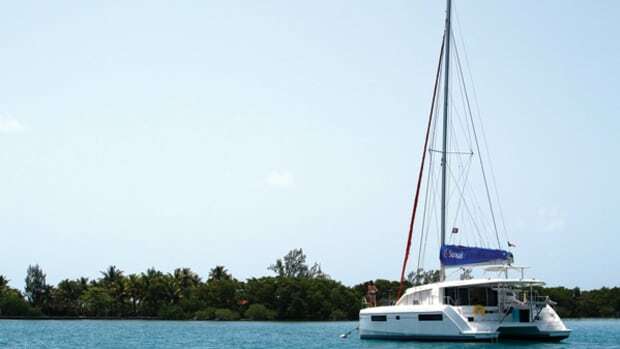 Wire shrouds and a split backstay support the double-spreader, deck-stepped aluminum mast. The rudder is a large semi-balanced spade on an alloy stock. One of the reasons I feel the 415 stands out in an otherwise crowded field is its looks. I love the clean lines and proportions of this boat, which hit a sweet spot between modern and maybe even slightly edgy, without being too radical. Then there are more quantifiable reasons. These include the visibility from the dual helms, the easily accessible walk-through stern and the wide seats in the cockpit. I was especially impressed with the teak-topped cockpit table. It was stylish, sturdy and formed a good mounting point for a chartplotter that pivots so the screen can be seen easily from either helm station. 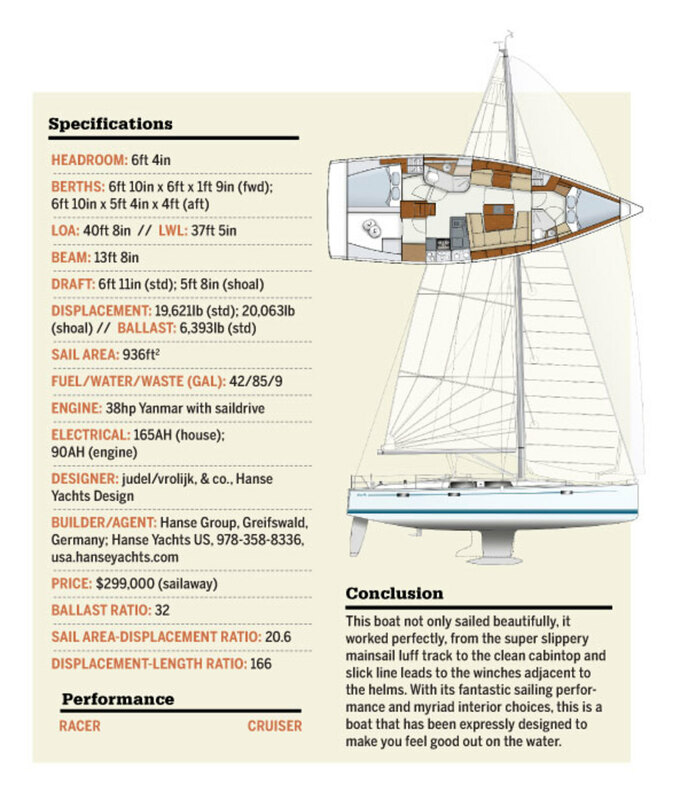 You may think an easy-to-read chartplotter would be a given on a modern performance-cruiser, but it’s not. 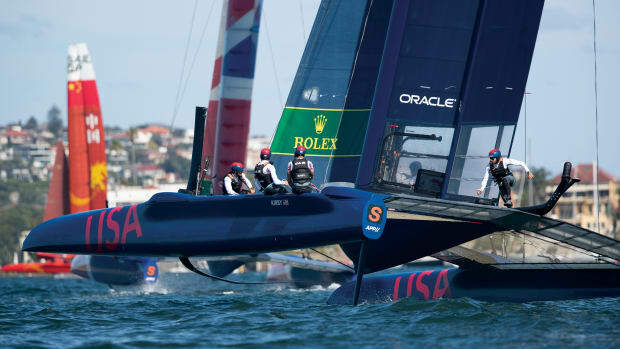 I’ve sailed far too many boats aboard which I had to crane my neck to see my performance data not to appreciate it when a builder does it right. Another feature I liked was the lack of cabintop winches. Instead, all lines from the mast are led under the deck to banks of stoppers near a pair of primary winches mounted on the cockpit coaming near the helms, right where you want them. Again, engineering away the cabintop winches may seem like a small thing, but it’s not. The unbroken line of the low slung cabintop is yet another small improvement over the status quo (both in functionality and aesthetics) that helps set this boat apart. Going forward, I did find the cabintop handholds to be a little short. But I liked the wide side decks with low bulwarks to help keep the crew on board, the flush-mounted deck hatches and the good-sized anchor locker.  Of course, with all lines leading back to the cockpit and an ultra-slick Antal mainsail luff track that lets the sail slide effortlessly into a stack-pack on the boom, you only really need to go forward when its time to push the anchor windlass button or grab a mooring ball. 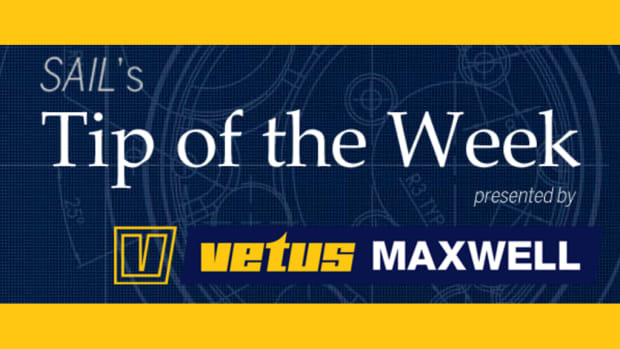 The theme of small things making a big impact is reiterated belowdecks, starting with the companionway steps. Unlike some companionways, which have steep, ladder-like stairs, the 415’s companionway steps are built on a shallow angle that make them super easy to descend. I also appreciated the extra wide companionway opening and the oversized clear plastic companionway hatch that contributes to the open and airy feel in the saloon. While the layout of the accommodations plan is pretty standard—decent stowage, U-shaped settee, good-sized galley with microwave, etc.—the distinction is, again, in the details. From the lights that can be dimmed and shades that be can pulled shut with a remote control unit to a stylish basin (more than just a sink) in the head, dedicated wine storage area under the sole, and a nav table that can be dropped down to provide more saloon seating (or a decent sea berth), a lot of thought has gone into optimizing every aspect of this boat’s interior living space. 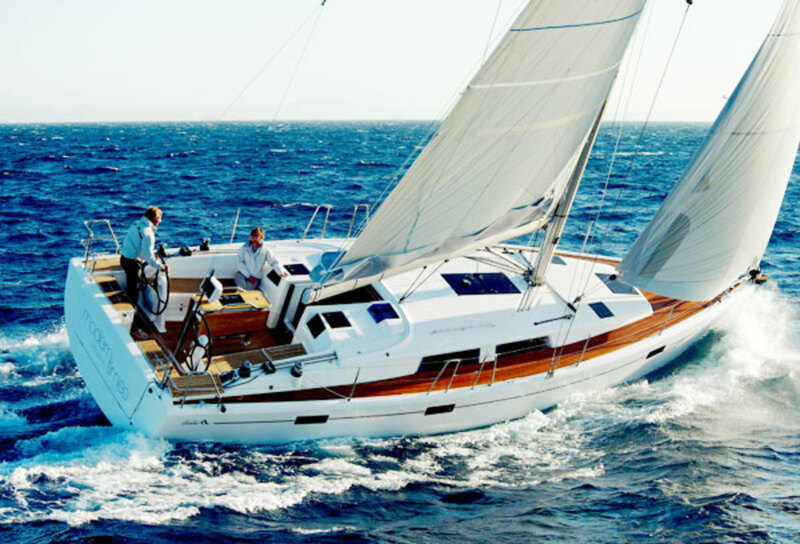 Like many 40-footers, the Hanse 415 is available with two or three cabins, but Hanse stands out among production builders in that it offers myriad other interior choices as well. Do you want one head or two? A large sail locker and a smaller galley? There is also an almost limitless list of interior fabric colors and wood finishes from which to choose. 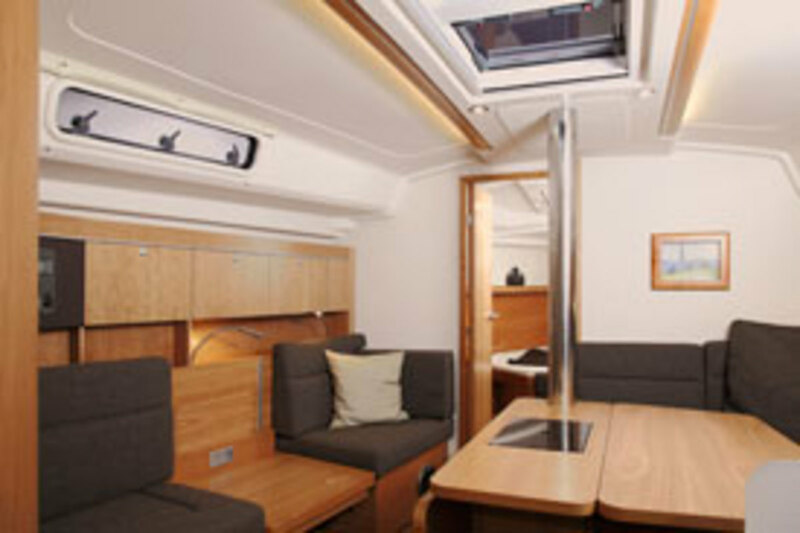 No matter how you configure the boat, the master cabin will be forward, with plenty of headroom, ventilation and stowage. (On the down side, the berth there gets pretty narrow around the toes forward.) 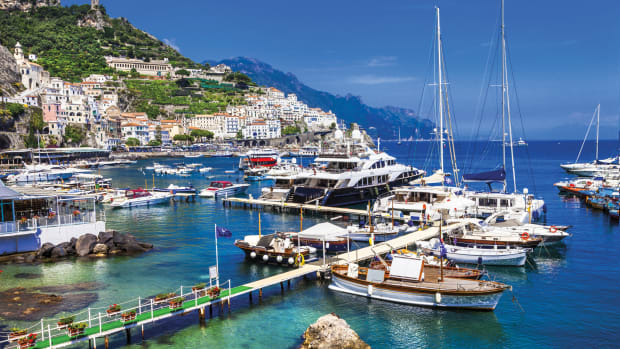 Guest cabins can be either medium sized or small, but in either case they’ll still have the essentials—including double berths, stowage and room to get dressed—that you’d expect from a guest cabin aft. I hit the weather jackpot during my test sail, which spanned several hours. As we raced to beat an approaching weather system, the wind built from a steady 10 knots to a fresh 18-20, gusting to 25. The seas got up as well as we nosed out into open water at the mouth of the bay, but the motion remained comfortable. 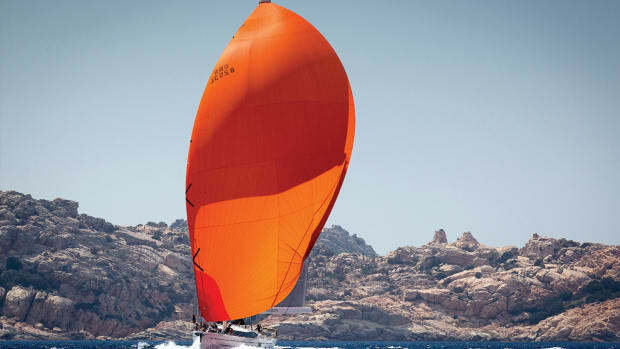 Boat speeds hit solid 8s on a reach and were in the 7-8 knot range when sailing hard on the breeze. Upwind we were a little over canvassed in the gusts. While the helm became a bit heavy on occasion, the boat never felt out of control, and I never worried about rounding up. Coming about was a breeze, thanks to the boat’s well-designed self-tacking jib. There’s no need to grind winches or worry about the lazy sheet running free aboard the Hanse 415: just put the helm over and go. 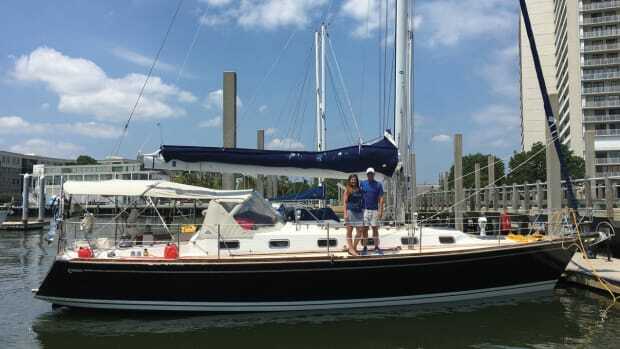 In sum: the boat was fast, maneuverable and forgiving in a breeze, and comfortable and easy to sail. What more could you ask for in a performance cruiser? No surprises here. 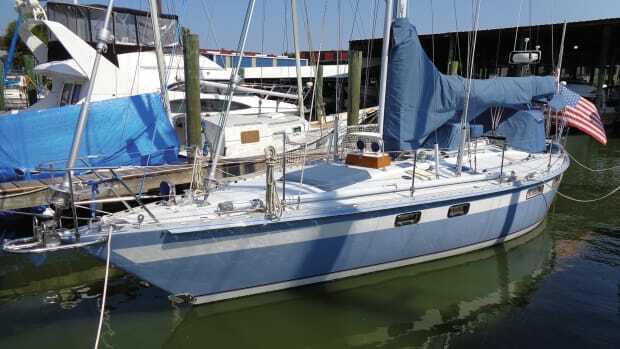 The test boat’s 38hp Volvo saildrive diesel moved the boat effectively in both forward and reverse, while the same big semi-balanced spade rudder that made sailing so easy, also made for good maneuverability going to and from the dock.